From Goodreads. Why be the sheep, when you can be the wolf? Seventeen-year-old Ismae escapes from the brutality of an arranged marriage into the sanctuary of the convent of St. Mortain, where the sisters still serve the gods of old. Here she learns that the god of Death Himself has blessed her with dangerous gifts—and a violent destiny. If she chooses to stay at the convent, she will be trained as an assassin and serve as a handmaiden to Death. To claim her new life, she must destroy the lives of others. Ismae's most important assignment takes her straight into the high court of Brittany—where she finds herself woefully under prepared—not only for the deadly games of intrigue and treason, but for the impossible choices she must make. For how can she deliver Death’s vengeance upon a target who, against her will, has stolen her heart? I rarely read historical fiction mostly because I haven’t found any that have blown my mind. But this book did!!! Not only was there a main character who was an assassin and a complete badass but there was a love interest that had me at hello (yes I know cheesy Jerry Maguire quote) even if he didn't have Ismae’s. 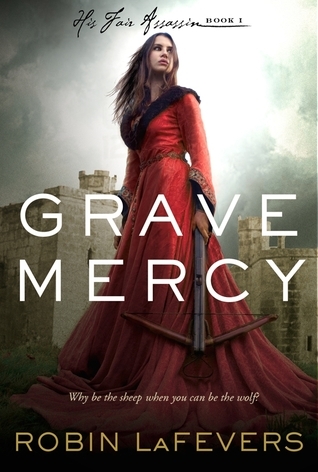 The court intrigue and the twists and turns gave me whiplash, but it was the good kind. I loved trying to figure out exactly who the bad guy was and who could be trusted and I fell in love with many of the characters not just Ismae and Duval. I think what I loved about this book the most was there was an ending. Yes I’m sure there will be more about Ismae and Duval in the upcoming books, but book 2 will be about another character Sybella who was a mystery wrapped in an enigma in book one and I can’t wait to find out more about her. And I have an idea who her love interest is but I won’t spoil anything all I will say is yay and I can’t wait for their story!!!! Slowly, as if afraid I will bolt, he reaches for my hand, which has somehow escaped from the covers. When he laces his fingers through mine, my heart does its now familiar panicked flight, bumping painfully against my ribs. My shoulder twitches as if to pull my hand back, but my heart overrules it. Add Grave Mercy (His Fair Assassin #1) to your Goodreads shelves. I totally loved that Grave Mercy had an ending. A satisfying ending, at that! And yessss, cannot wait for book two! Sybella sounds like she would be super interesting to read about! Lots of stuff going on there! *swoons with you* I've ordered this book . . . can't wait to read it now! Great review! I loved this story. It was so wonderful, INCLUDING the romance. And I would LOVE to see more of Duval/Ismae for sure, but it's exciting to see more of the other sisters in the convent. I wonder if I'll love them as much! Yea! Glad you liked it so much. It's always nice to read a great review about a book you've been waiting to pick up! This one has actually been shelved on the end cap of the adult section at the bookstore near my house. I think it's a phenomenal book and anyone can read it!